If this is the first HG post you have read then please do me a favor and click here to find out about this series we’re in for August – Healthy Girl: Making August Count! We are in the thick of the transition from summer break to fall. Some places around the country know that in a matter of weeks their temperatures will plummet and they will be pulling out the sweaters and boots. I live down here in the South so that isn’t a current concern but my kids will be grabbing the backpacks and I can promise you I will be wearing a sweater in the mornings in no time. Last week I talked about why NOW is the time to join a gym. You look good. You feel good. You’re so ready! It isn’t really a secret that we eat less in the summer. That summer heat can kill an appetite for things like pot pie, fried chicken, and cream laden soups. We want lighter fare in the summer. I mean that’s a big duh. What we have to be aware of is this simple principal: We don’t have to have heavy food as the temperatures drop to be happy and healthy. You guys! We can still eat light meals and not be at risk of death! Who would have thunk it? All summer you probably ate fresher foods. Did you enjoy watermelon? How about tomatoes? Were there more salads and grilled foods in your non-existent food journal? I bet so! As we transition away from summer’s bounty we need to prepare ourselves for what September holds. Guess what is fresh in September? 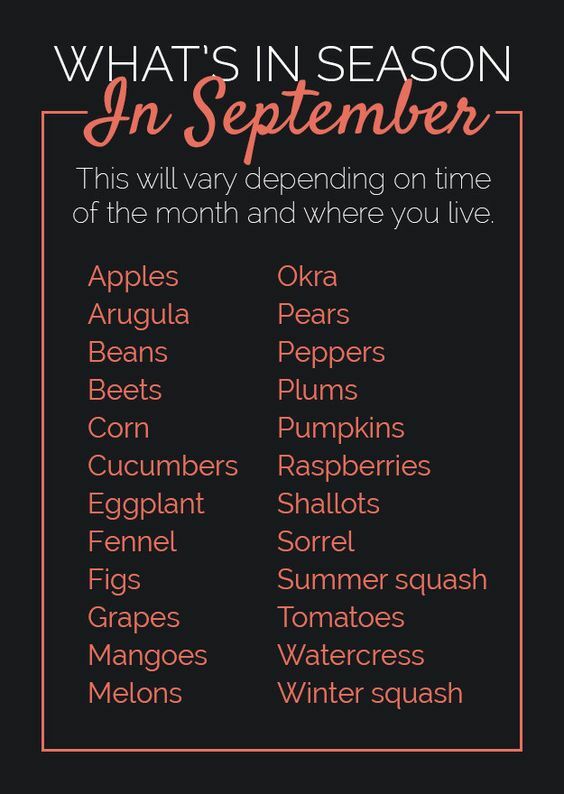 That’s a pretty good list (thanks Buzzfeed) to use to plan out some shopping trips to your local farmer’s market. I wanted to take a few of the items on that list and explain how we can stretch them out. Apples are great as a snack, we know this. However, I also love to eat them for breakfast with natural peanut butter. I also will use them in main dishes when I fix a pork roast (apples and onions go together fabulously!) Throw them in your kid’s lunchboxes. BUT be careful because apples have a high sugar and carb load so more than one or two a day isn’t going to be very beneficial. And the appropriate size of an apple is the average size of a female’s palm. Cucumbers on toast with cream cheese. BAM! Yes. Eggplant is a favorite of mine. I prefer some eggplant parm once a year. I was perusing the internet for a good healthier recipe for it and found this – I suggest we try it! The figs are producing like mad around my house. OK so I worded that incorrectly – at my neighbor’s who have fig trees. 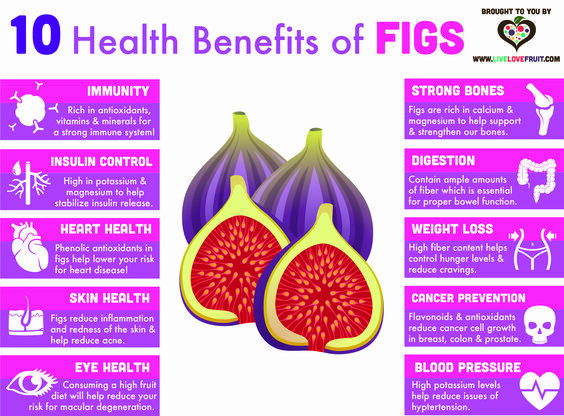 I haven’t been a fig fan but did you know if you need to decrease fat in a recipe you can add in a fig? Sure can! Just like applesauce or prunes pureed figs can do the trick of adding moisture and decreasing the fat content! I guess I need to give them another chance, huh? 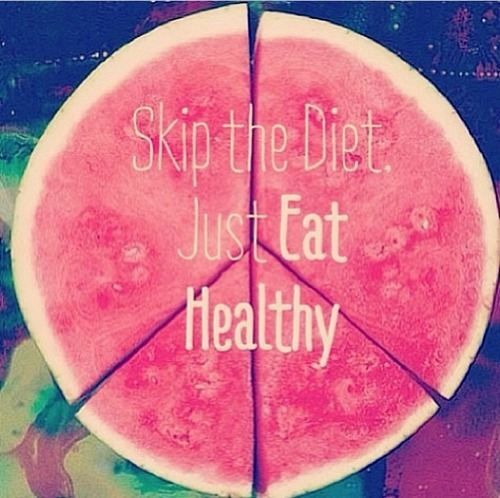 Watermelon is still my favorite snack and sometimes I can eat a personal one and its called dinner. I do not suggest we do that on the regular but there is fiber and a mother load of water in this fruit of summer! All the good squashes are still coming off the vine! 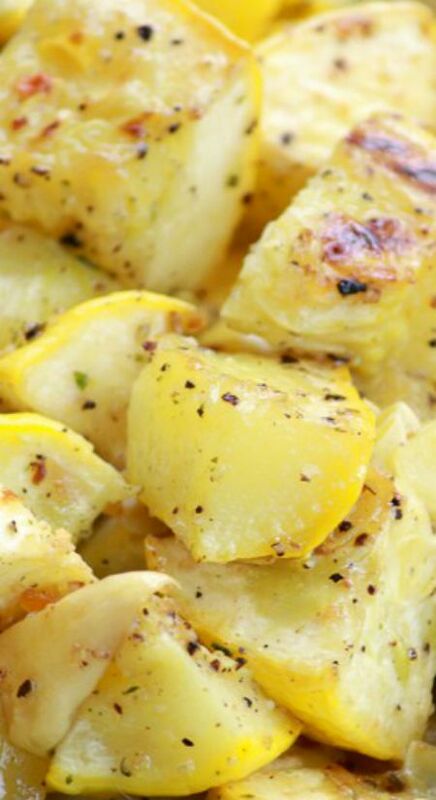 Squash is such a wonderful alternative to so many heavy carbs that like to rest upon our midsections. Take advantage of lower squash prices now for fabulous soups and oven baked goodness for when then temperatures nose dive in the next weeks. Take taco night on a twist with this interesting recipe that calls for no gluten! And finally – the bad girl in me sees a vine ripe tomato and immediately goes for mayo and white bread. To make a smarter decision I now use Joseph’s Flava Bread but I still use the mayo! You can continue eating smart this month and next! Just because the kids have a set bedtime again does not mean you should be slacking in any way, shape, or form. Get your walks, work out classes, and sweat sessions in. They are a priority just like brushing your teeth! Have you successfully scheduled your gym time in your adjusted calendar? I want to know! Share it! Put it out there. Tomorrow click back over here to get some great back to school food ideas for breakfast, lunch boxes, and dinner. We will talk about how sometimes the most basic stuff is the best! Previous postIt’s Party Time: A Lot of Food. Next postBack 2 School With The Bullards Part Food. August-the beginning of October is usually the best time for my garden. Also, I live in a state where we grow and supply a lot of fresh produce during the next few months…hello apples. You are right (and I may have snorted coffee through my nose) about being able to eat light without dying in the fall…That was funny! h from July-end of August! Oh my goodness this phone!!! So what that comment should say is: That’s cool! Our gardens flourish from July- Labor Day here! I just signed up for the fall local produce club like I did for the spring, I cannot wait! I will be making those taco stuffed squash! I always do worse in the summer because beer and margaritas! 🙂 I need to do some research on freezing some of my fave veggies like butternut squash while they are in season. Not sure if it’s an option or not. A lot of people freeze everything around here. I’m just not into that LOL!